The 200-year-old mystery of Mercury's orbit — solved! It wasn't too long after Newton published his laws of motion that people noticed something was off about them. To be specific, they were off by the orbit of an entire planet. And they remained off until Einstein, and general relativity, explained why Mercury moves the way it does. The laws of motion were, and remain, powerful tools for understanding the world. When they debuted, Newton used them to explain the motions of pendulums and the motions of planets. Both the earthly and the celestial fell into the realm of the explainable, and people settled back, comfortable with their conception of the universe. That is, until something about Mercury's orbit seemed just a tad off. The orbits of the planets are slight ovals, with the sun located toward one end of the oval. The point at which the planet comes closest to the sun is the perihelion, and the farthest point of the oval is the aphelion. The oval orbits themselves move. As if the sun were a pin stuck into them, the orbits slowly rotate around it, in a motion called precession. The precession of the orbits is accounted for by Newton's laws of motion. As astronomers charted the progress of the planets, they conformed agreeably to predictions based on those laws of motion. All except one. Mercury's orbit made its round faster than predicted. It didn't race ahead. The precession was 93 percent accounted for, but no one could adequately explain that last seven percent. Something strange was going on. Astronomers assumed that they had missed something. It wasn't an unreasonable assumption. Urbain Le Verrier, after all, had noticed that something was going on with Uranus' orbit, and by studying the variation deduced the existence of Neptune. It was easy to lose a little planet in such a big sky. For a while, people assumed that a mystery planet called Vulcan was throwing off the precession of Mercury. After Vulcan failed to show up, other astronomers assumed there was an asteroid field, or a massive field of dust near Mercury. This would add a little extra mass to the equations and explain why Mercury precessed so quickly. Still the years went by, and no field of dust showed up. Where people went wrong was looking for objects. Einstein eventually revealed that they should have been looking at space itself. In his theory of general relativity, Einstein showed that mass warps space. 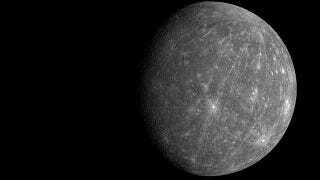 This warping didn't noticeably affect planets far from the sun, but Mercury was so close that its strange precession was visible as soon as people started paying close attention. One way to understand the warp in space, and how it affects Mercury's orbit is to draw a quick, exaggerated oval on a piece of papter. Put the sun at one end. Draw a line from the aphelion (the farthest point from the sun) to the sun itself. Then cut along that line, and slightly overlap the two resulting flaps of paper. The paper itself will be drawn into a slight cone shape. If you look at the orbit, it will literally be bent out of shape. Instead of the orbit gently curving one its way back towards the aphelion, it will curve much more tightly. Another way to think about it would be to imagine rolling a penny along a surface that suddenly curves. As the penny goes around the curve, it changes speed and course, but if you can't see the curve, it would look like it inexplicably turned on its own. For two hundred years, we were the observers of that inexplicable penny. We saw Mercury makings its rounds around the sun, quickly and sharply, without knowing the reason why. And although we still can't see the curve of the universe, we do now know that it's there.